GEDOK Women Artists’ Association - GEDOK Karlsruhe e.V. The GEDOK - The Society of the Association of Women Artists and Art Friends - is the largest (about 2.800 members) and best established interdisciplinary artists organization cultivating a long and rich tradition in Germany. It was founded in 1926 by Ida Dehmel (1870—1942) under the name of "Gemeinschaft Deutscher und Oesterreichischer Künstlerinnenvereine aller Kunstgattungen - GEDOK". The GEDOK Karlsruhe was established anew in 1949. The Association had disbanded itself in 1933, subsequently to the restrictions imposed on artists after the Nazi seizure of power. 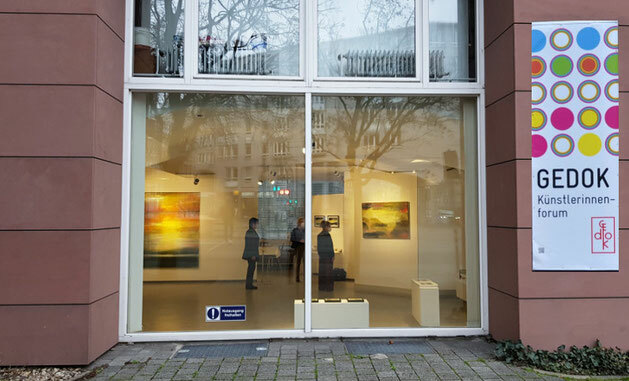 From 1992 onwards the GEDOK has its own gallery facilities - the Women Artists' Forum -, in which about 10 exhibitions are organised annually, in addition there is room for a series of readings, lectures and discussions. Some exhibitions and events take place in the exhibition facilities of our cooperating partners. The GEDOKs main work has evolved around aiding, fostering, nurturing, supporting, stimulating, encouraging, facilitating and promoting the interests and artistic work of women artists. An important part of the work includes promoting the young, talented and up-coming artists, in the public-eye and thus strengthening the connections between artist members and art sponsors. In the GEDOK all artistic disciplines are represented: Applied Arts, Fine Arts, Performing Arts, Photography / Media Art, Literature and Music. The GEDOK is an approved nonprofit organisation, it is non-partisan, politically and religiously unaffiliated. It is an organisation that finances the voluntary work from contributions and donations, as well as from project-bound maintained grants for the promotion of the arts. Gallery: Wednesday.Thursday, Friday 3:00 to 5:00 p.m., Saturday & Sunday 2:00 to 4:00 p.m. Please see the menu Aktuell for further information about current events and exhibitions. Please note that some exhibitions and events take place in the exhibition facilities of our cooperating partners. In order to be able to hold this cultural enterprise upright, the GEDOK Karlsruhe receives an annual grant from the towns' Department of Culture and the district administration subsidises some of the events that are held. The group gladly welcomes both male and female sponsoring members, people who are willing to support the artists through their active participation, both in idealistic terms as well as financially. For sponsors, we are able to offer free admission to all exhibitions and events and a 5% discount on works of art from GEDOK exhibitioners. If the GEDOK is of interest to you, a monthly membership fee of 6 € is all that is needed. A jury of GEDOK members decides which artists have qualified to become affiliate members. For this process, the jury uses professional criteria to ensure the highest artistic quality possible. Affiliated members are eligible to participate in GEDOKs nation wide activities: the GEDOK Artists Award, exhibitions and catalogue promotions, exhibition projects within the field of arts and crafts, music competitions, the Ida Dehmel Literary Award as well as the GEDOK Literature Promotion Prize and the GEDOK Womens International Composers Competition. The GEDOK is a member of the International Society for Fine Arts (IGBK), section Federal Republic of Germany, the German Music Council, the German Cultural Council, the German Womans Council as well as being an initiating member of the Art Fund; the GEDOK is represented through the Collective Rights Management Association (VG Bild-Kunst) and the Artists' Social Welfare Insurance (KSK).